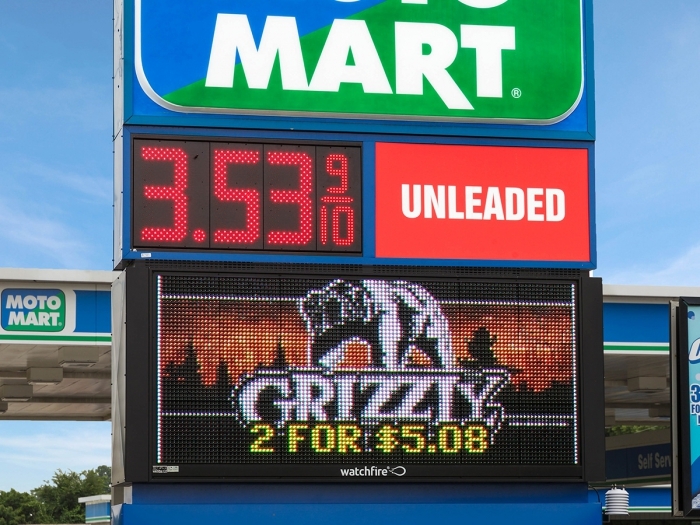 MotoMart operates many gas station/convenience store locations throughout the Midwest, and says that thanks to their Watchfire signs, they have experienced increased sales of high-margin products and services. MotoMart, a gas station and convenience store chain owned by FKG Oil, prides itself on offering a loyalty program and other valuable goods and services to its customers. The majority of the chain's stores used changeable copy signs to advertise store items. MotoMart Facilities Supervisor Andrew J. Wall realized they didn't keep customers updated because they were difficult to change. When MotoMart purchased its first 19mm color Watchfire LED sign for a station in Belleville, Ill., the colorful messages advertised the company's popular WAND Card loyalty program. These messages improved sales, drawing customers from the gas pumps into the store to take advantage of special deals that featured the store's most profitable products. Supervisor Andrew J. Wall wanted to replace the chain's changeable copy signs with signs that would draw more attention to the stores' highest margin products. Wall worked to find a better signage solution: Watchfire LED signs and Price Watcher™ gas price signs. Once Wall purchased a 19mm LED sign, MotoMart staff members created advertisements for the company's loyalty program and a wide range of convenience store products. Wall explained that their staff thinks, "Watchfire's software is great and so easy to use." Thanks to the Watchfire LED sign, MotoMart has increased sales of high-margin products and services. Impressed with the image quality and reliability of the Watchfire products, Wall purchased over ten more Watchfire LED signs, including Price Watcher gas price signs, for MotoMart locations throughout Illinois. "We know that when we put promotions on the message centers it definitely drives shoppers to the bargain," Wall said. Wall was so happy with the convenience, reliability and performance of his Watchfire LED signs that he decided to give Price Watcher LED gas price signs a try as well. MotoMart purchased its first Price Watcher sign for a store in Godfrey, Ill.
Wall has been impressed with the Price Watcher and explained, "The difference between Watchfire's Price Watcher and competitor models is how they're built. With LED signs, the biggest potential failure is from moisture. But, with Watchfire's signs, water just doesn't affect it, it can't get in." MotoMart now owns several signs throughout the state. Each one advertises the loyalty card program, company website, car washes, gas prices and in-store deals. Wall concludes, "We know when we put certain products on the sign, we sell more of them. I would have to say at MotoMart we have seen a definite increase in business from our signs." Let us help you determine how much impact an LED sign can have on your bottom line with a free traffic and site analysis.